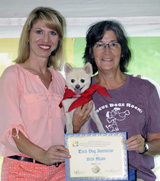 Beth Mann is a Karen Pryor Academy Certified Training Partner (KPA CTP), a Certified Professional Dog Trainer-Knowledge Assessed, a Certified Nose Work Instructor, and a licensed Pet Partners Evaluator and Instructor, as well as a Certified Trick Dog Instructor and Canine Good Citizen Evaluator. She is member of the Association of Professional Dog Trainers and Western Reserve Poodle Club (Poodle rescue committee). Among her six dogs, Beth has three therapy dogs and maintains an active visitation schedule at both medical facilities and assisted living centers.